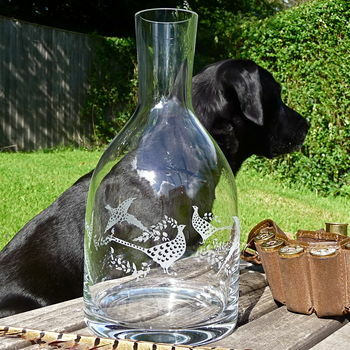 This handsome Carafe is engraved with a fabulous design of Pheasants flying round it. This is such a lovely British Country piece with it's unique design of Pheasants. A great addition to the Dining table and equally at home in a country kitchen. These can be used for wine or water and jolly handy if you like to decant wine from a wine box. With the additional option to have it personalised this also makes a great gift, maybe for a wedding or a thank you for a great day's shooting. We recommend names, initials and maybe a house or shoot name with date below. Whatever you choose, we will space your text so it makes an attractive design. Your Carafe will be wrapped in tissue and packed in one of our exclusive gift tubes tied with ribbon. Our glasses are handmade and mouthblown by skilled craftsmaen using aged-old techniques to create beautiful quality glass with a bright shine and good weight. 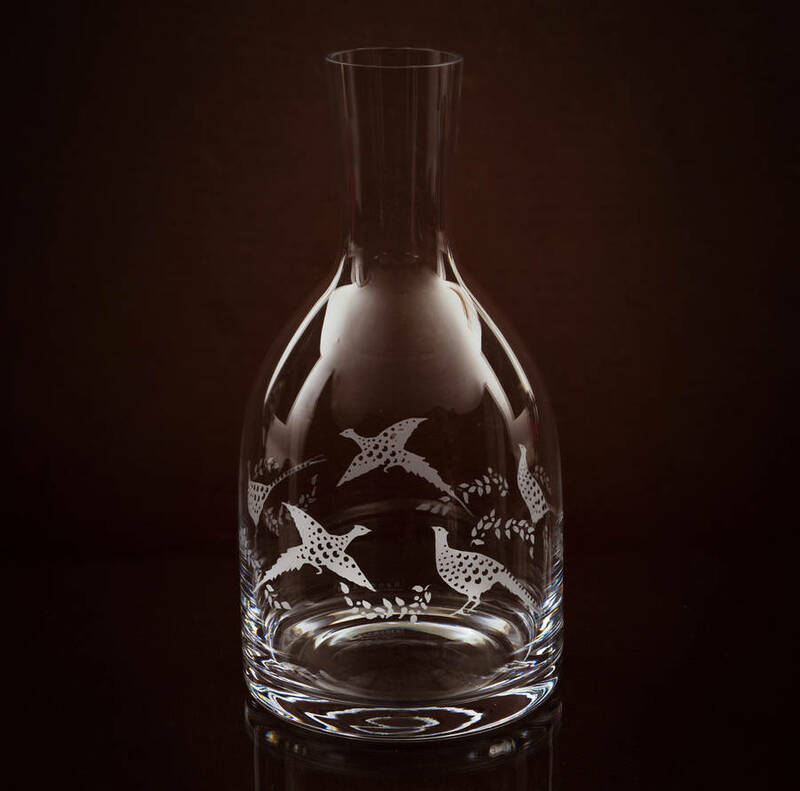 Our engraved designs are unique to us and each is individually engraved by skilled artisans. 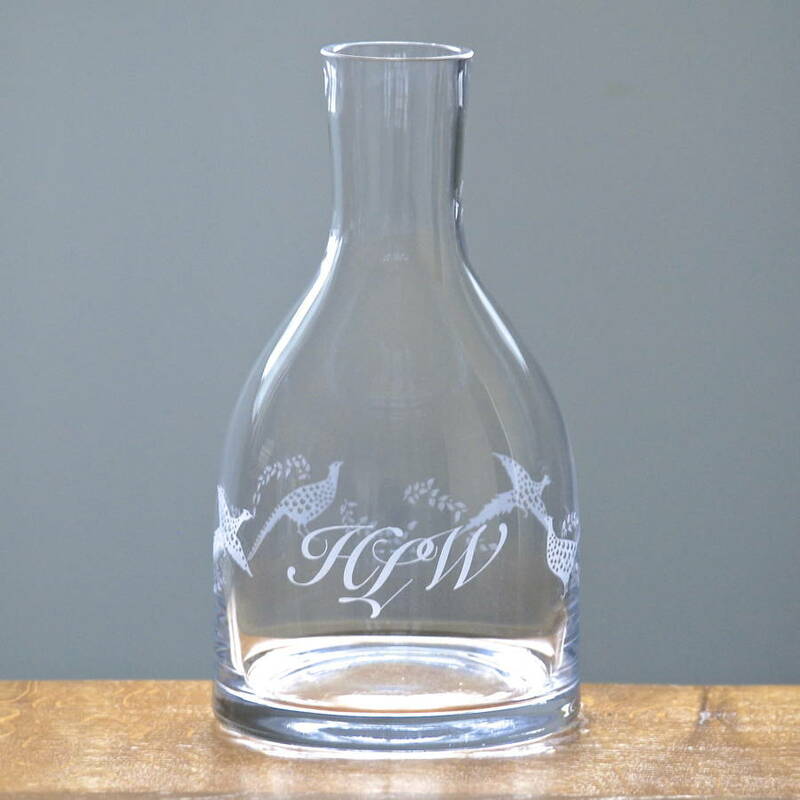 Because we engrave to order we are able to offer a tailored service with Bespoke engraving for that extra special present. We recommend handwashing with a soft cloth and polishing with a quality tea towel. This product is dispatched to you by Jojo Glass Design.